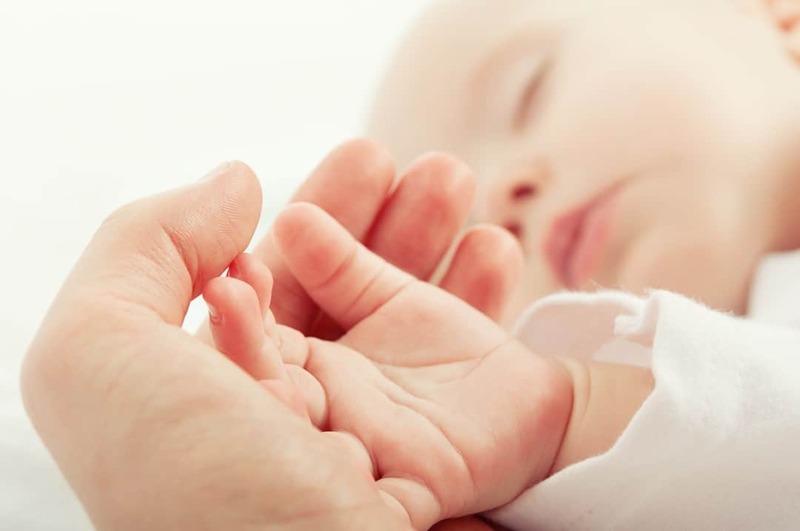 Newborn parenting can be exhausting – here are some tips to help cope with sleep deprivation. 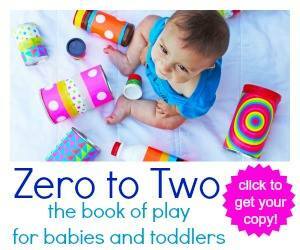 Discover fun ways to bond with your baby. My oldest child rarely slept when I wanted or needed her to! She’s brilliant now as a twelve-year-old, of course, but the beginning was rough. I got to be quite an expert at coping with sleep deprivation, and pulled my top tips together in this post when child number three was born. I’m re-sharing today with new and improved editing to make it easier to read! 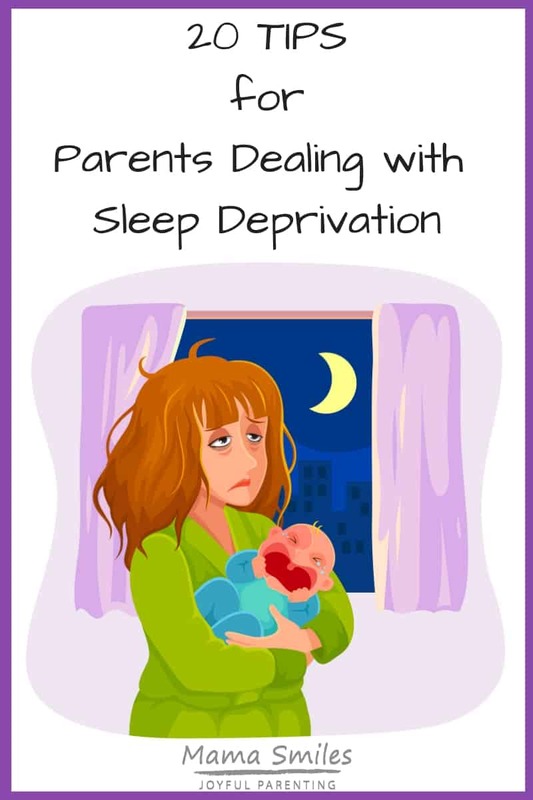 To all the sleep deprived parents out there, I promise it gets better! Hopefully these tips help you cope with the exhaustion in the meantime. 1) Remember that it won’t last forever. Even my worst sleeper started sleeping through the night eventually. Many kids start sleeping through the night well before their first birthday. 2) See the humor in sleep-deprived mistakes. Be willing to laugh at your sleep-deprived behavior – I LOVE these Confessions of a Sleep Deprived Mommy from Mommy With Selective Memory. 3) Consider co-sleeping to reduce sleep deprivation. Co-sleeping saved my sanity, big time. Be sure to read up on safe co-sleeping before giving this a go. 4) Have someone else watch the kids so you can sleep. I know that this can feel like a lot of work to arrange, but it’s worth the effort! 5) Swap off who gets up with the kids on the weekends with your spouse. This is important regardless of whether or not you both work outside the home. Stay at home moms work hard, too, and they need the sleep. 6) Teach kids to have quiet time, even if they aren’t napping, so you can nap. When Emma was a very-much-not-sleeping-through-the-night toddler and I was pregnant with Johnny I used to go with her into her (very child-proofed) room, close the door, and sleep while she played. Don’t underestimate the value of power naps. 7) Embrace the benefits of being up. I learned to use the quiet hours in the middle of the night to bond with the child who is awake. It can also be a great time for reflection, prayer, or meditation if you don’t let yourself get upset about being awake. 8) Don’t try to be supermom. Leave the dishes/laundry/cleaning for another day when you feel especially exhausted. Go to bed early instead. Families need rested mothers! 8) Eat well to help your body cope with exhaustion. Having a baby puts so much stress on your body, and then sleep deprivation comes along and exacerbates that. Eating healthily makes a huge difference. 9) Use Tools to Compensate for Being Tired. Write everything down – your tired mind needs all the help it can get! To quote Caz at A Little Learning For Two: “Our youngest has a sleep onset disorder and hasn’t slept well from day dot. My only suggestions are to keep a notepad and pen in your bag because your memory will never be the same, be as organized as possible, learn to enjoy sleeping on carpet and make sure you eat as healthily as possible!” I use Google calendar, a white board, AND write everything down on a paper calendar. And still forget things, sometimes. 10) Have activities planned to help make it through the day after a rough night. I try to have something quiet the kids can do first thing in the morning so that I can wake up slowly without resolving sibling conflicts or listening to complaints. This can be an organized activity like mess-free finger paint, or something as simple as setting out a toy you know the kids enjoy (and can share nicely). 11) Go to bed early to sleep while you can. 12) Make sure you drink water during the day. Everyone talks about coffee, but drinking enough water can work wonders when you’re dealing with sleep deprivation. This is simply one more piece of looking after yourself, but it’s an important one! Don’t underestimate the transforming power of a walk around the block. 15) Sometimes you just need to cry. Teething babies, sick kids, and night terrors tend to break me down. 16) Give yourself some downtime. Schedule breaks for yourself in the morning or evening. Or both! If you can’t get a break from looking after kids, find something you can do as a pick-me-up. I loved listening to audiobooks while playing on the floor with my kids when they were small. Allow yourself to simply sit and hold your baby, sometimes, even when there are chores that need doing. 17) Make the most of little luxuries. Time out with friends, a bath, or something as simple as a food you love can make it easier to cope. 19) Don’t compare your baby’s sleep to other babies. Maybe your friend’s baby slept through the night at two weeks old. Some babies do that; others don’t. Avoid wasting precious energy comparing and focus on looking after your child as best you can. 20) Get Help When Needed! I’d like to add one more tip: If none of the above are working, if you just cannot cope with life, please see your doctor. It could be postpartum depression, and you could be on your way to feeling much better with support and counseling and medication. It’s not you, it’s your brain. What are your best tips for dealing with sleep deprivation? Please share tips on my Facebook page, or tag me on Instagram. I love that picture of baby Lily. This is such a great post – wish I had read it when I was in the middle of sleep deprivation! We renamed my youngest the non-sleeper for the first year of her life. We have a small two bedroom house and when the lack of sleep was at its worst I moved in with the baby and my toddler moved in with my husband. At least then the two of them would get a decent nights sleep and not worrying about disturbing them made it easier to get the little one back to sleep. Co-sleeping also helped a ton to get us through that time. DH and I have done that before! Great tips. I love the reminder to “embrace the benefits.” I’ve been able to do that more with newest little guy, my third child. Don’t get me wrong, I’m groggy and miserable when he wakes in the night, but then when I snuggle him up to me to feed him and look into his eyes I try to remind myself that he will be my last little one and to enjoy these moments. Not having any clocks I can read in the dark makes a huge difference to me. I do much better when I don’t know that it’s only been 45 minutes since the last night waking. Completely agree on the clocks! The only reason I see to look at a clock is if you are trying to figure out if your kid is waking up at the same time every night (so you can dream feed or try putting them to bed earlier/later to see if that helps). Are you kidding? I had to let mine scream through the night once.. And never “play” with them in the middle of the night, if they woke up I kept the lights off, NO talking, NO playing.. Night time was business only and I had them sleeping through the night by the time they were 6 months old.. Sleep in their own rooms, with a fan on or light radio. There is nothing noble about allowing a child to control your sleep. It is dangerous for you and other children, and God forbid you have to drive a car after contiued sleep deprivation. Take care of yourself, so that you can be there for your child. Hopefully the information in this post is useful for parents dealing with newborns (who no medical professional would ever advise sleep training). If you let them scream through the night, aren’t you forcing yourself to be sleep deprived? .. from a mom whose son is 5, suffers from multiple health issues, and STILL doesn’t sleep through the night. And thank you for pointing out that sometimes there are medical reasons that children don’t sleep through the night. I did the same. It only took my babies 2 nights before they learned when it’s dark we sleep when it’s light we can wake mommy up. I agree with Liz taking care of myself at night and teaching my kids how to sleep has been great for our family. I still enjoyed the tips though for the nights the kids are up with the flu barfing all over. Not that I want you to be sleep deprived but it is good to know that I’m not the only one with a toddler that doesn’t sleep well. Everyone always tells me to let him cry and not nurse him at night (even his doctor) but I’m his mama and I just don’t think that is right for him. These tips are great and don’t let any negativity get you down. Nobody knows what is better for your children than you! It is nice to know we’re not alone! Such a positive and helpful post. Thank you, MaryAnne! I cried reading this, my little miracles are 18 months apart and I haven’t had a good nights sleep in almost 3 years! Some nights are better then others but I’m still doing good to get 4 hrs straight. I’m a chronically sleep deprived, stay at home mommy & a grad student. Yay!! I’m not the only one, that means its survivable. :) thx!! Babies 18 months apart and a grad student? Sending hugs! Great post MaryAnne! The first is my favorite: it won’t last forever and one day we’ll yearn to be able to meet their needs as easily as we could in the middle of the night. That’s not to say we’ll miss the sleep deprivation, of course! :) Thanks for posting. Thank you for sharing, Kat! ohh…how co-sleeping and night-nursing saved me… my lactation consultant was amazing. when my son was about 5 months, she suggested it and we haven’t gone back. my son is now 3.5 and we still co-sleep. it gets us all through the night. and i think that it has strengthened our relationship. we tried “sleep-training”/CIO for 8 minutes. that’s it. that was as long as i could hear him cry…some parents can do it. some can’t. it all depends on the family. i also did like you suggested with writing things down. i kept track of his sleep cycle so that i new his light sleep times when i needed to be near. you’ve got some great tips! we are co sleepers, too. as a working mom, it was my only option! now, my kids are 3 and 5. we start in our own beds, but every morning, we wake up in a family bed. we love it completely. the first few years were tough. but nothing worth loving and doing well is easy. Love your “nothing worth loving and doing well is easy” point, Tricia! I cannot begin to tell you how co-sleeping and night nursing has helped me. Even more, though, just knowing that other Moms out there do it, too, and I’m not alone. The comments from friends/strangers regarding my choices are harder to handle than the sleep deprivation at times. So thank you. And thank you for taking the time to leave this comment – it means a lot! Hooray for a helpful lactation consultant! Very helpful list, MaryAnne. I remember people telling me about this before but the magnitude of it not registering. Co-sleeping was great for me (I mastered the art of nursing laying down) but I can remember going to bed with the first and being so depressed knowing I was not going to be sleeping. Definitely knowing it doesn’t go on forever helped. For some reason it was easier to accept with the second. I’ve found it easier to adapt with later kids, too. Maybe partly because we know it does get better? Great post – as a mum of 2 under 3’s who between them haven’t slept through the night and due to pregnancy problems I haven’t either since November 2008!!!! I survive but can be ratty during the day when the sleep is at thee worst – I spend a lot of time appologising. But I do cope I’m not a complete mess – the good nights I get a 3 – 4 hour stretch of sleep in a row the bad nights I believe we are up every 45 mins but can’t tell as we don’t have clocks in our bedroom just an alarm on my mobile. Hopefully your two start sleeping better soon! I’ve definitely been there!!! Great post! I never did co-sleeping, I was just too nervous about it. Abby was a good sleeper at night though. She slept through the night (7 hours) at 8 weeks in a cradle swing. That was the best $100 I’ve ever spent. LOL! Those first 8 weeks were pretty rough though. She had severe acid reflux, poor thing. She couldn’t lay flat at all. We did have trouble with getting her to sleep as she got older, but we just stuck with the same routine…bath, books, and rocking in the chair/singing. I remember a few times we let her cry it out a bit, only because it wasn’t a real cry, just a whiney one. I do think the CIO method might work for some people, but I just can’t imagine doing it. Actually, my parents said they had to let me cry myself to sleep. It only took 2 nights though. They still remember the details of that, it must have been tough. LOL! Oh and baby Lily looks so cute! Love this post! My son was extremely colicky and also didn’t sleep. There is a reason that the military uses sleep deprivation as a torture technique because it is torturous! I’m not sure how any of us survived those months. Ugh…Great suggestions. I love this point you made: Embrace the benefits. I’ve learned to use these quiet hours in the middle of the night to bond with the child who is awake. Although I’ve never loved having my sleep interrupted, some of my most tender memories as a mother are comforting my babies during the wee hours of the morning. It makes me feel close to heaven. “Close to heaven” – love this. Thank you for putting it so beautifully. No. 1: Remember it won’t last forever. I remember sobbing to the midwife that she was going to have to ‘take away’ my baby as I was worried that either me or my husband might ‘throw him out the window’. Glad she didn’t and knew we never really would have as those terrible, terrible nights do seem like a distant memory. He’s 2.5 now and still no sleeper. Won’t go down till very late and up at the crack of dawn with a few night wakenings in between, but nothing like he used to be, and I can cope now. LOVE your tip of being organized – so true!!! I hope your 2.5yo starts sleeping through the night soon! I wasn’t planning to comment because I have very little internet time right now, but WOW, this post blew me away: so beautifully reflective, encouraging and helpful… a wonderful reflection of who you are. SO glad you share your thoughts and wisdom with us, MaryAnne! I had to reread this! This sounds like a wonderful arrangement for everyone! My childless sister took my kids on day-long outings a couple times this summer, right before baby #4 was due. My kids had a blast and bonded with her, and I got some sleep. SO nice!!! My boys are 15 & almost 21 now, so it has been a long time ago, but I do remember one thing: Sleep when the baby sleeps. Neither one of mine were good sleepers, waking 2-3 times per night until they were over a year old. I was working full time outside the home with the first one and it nearly did me in. I was trying to be “super mommy”, doing the laundry, cooking meals, cleaning house, etc. when I came home from work instead of resting when he was sleeping. With the second one, I was a stay-at-home mom & learned to sleep when he slept & do my work when he was awake, lying on the floor, swinging in the swing, sitting in the bouncy seat, etc. As you can see, I survived and you will too! Now if I can just survive the 15 year old getting his driver’s license! Excellent post with some great advice! I don’t know how working moms survive! Good luck with the driver’s license, and thank you so much for taking the time to comment! Just a note of encouragement to anyone reading who is considering letting their cry it out (which I am a big proponent of for me and my family – but to each their own). Starting around 4 months old I started letting the child try to console themselves when they wake up and gave her a few minutes to cry it out. The amount of time I let her cry increased with her age until she got to around 8 months old. Sometimes she would go down fine for a nap. Other times she would protest and cry. I finally set my max time limit to one hour. ONE HOUR. I thought that was a long time to listen to your kid cry. And she stopped crying at exactly 58 minutes and put herself to sleep. After repeating that long drawn-out battle twice, she has slept like a champ since then. That seemed to have been the magic length of time for her. Child number two was a terrible sleeper from day one. Or perhaps just a light sleeper and woke up to just about any noise (despite a loud white noise machine). After struggling with repeated wakings in the night and co-sleeping, etc, we went on vacation where he got used to co-sleeping again (now at 17 months old). When we got home I finally said enough is enough, put his crib about 10 feet from our bed, and let him cry it out. He not only cried….he SCREAMED in anger. Not for an hour. Not for two hours. Not for three hours. Somehow he managed to carry on for FOUR HOURS straight. However, yet again, since that night, he has slept through the night without fail for the last 4 months. And he still loves me, or so it seems :) Obviously not the solution for all parents, but never underestimate a child’s willpower and their ability to manipulate our sleep schedules! In the end, a good nights sleep seems best for everyone, even if it’s hard and painful to get to that point! 3 years old and kids are not sleeping thought the night? Mine slept through at 2 months old and has ever since he was always a very relaxed baby but we make it known that bedtime was time for sleep. When he would get tired and cranky we put him in his crib and made sure his room was dark (eclipse curtians are amazing) then put the campfire sounds on about 5 minutes he was out. No feeding no playing he knows what his crib is for. Now we have an amazing routine dinner at 7 bath at 7:30 and bed by 8. Call me old fashioned but this worked for us well and I agree with an earlier post that children do need to know that bedtime is not a time to mess around. I do not think I neglected my baby by letting him fuss for a couple minutes (just fuss not a full on mommy I need you in that case there I was changing a soiled diaper) I think my son actually does better like this he is well rested and easy for our babysitters and its very easy to tell if something is off for him because his schedule will be weird. I have a wonderful sleeper and that came from a little hard parenting just my opinion but it seems to be doing well. I’m glad that worked for you, Andie! That is a very important tip, Jen – thanks for adding it. I’m actually going to update my post to add this in at the end. I have a 4 year old that has never slept through the night so sleep deprivation runs rampant in my house. He is my second child and I am 7 months pregnant with #4, both of my other children are champion sleepers but he is also not a good eater along with being a very light sleeper, if the wind picks up he is awake. I had to learn that bedtime doesn’t always look the same for every child. He goes to sleep in his room with all of his lights on but that is after a year of him only sleeping in the chair or recliner. I tried the cry it out and it made us both sick, I tried taking him back to his bed but after 7 times a night for 2 months I just had to realize that this is how he functions. You will adjust and I couldn’t agree more about the organization the night before and making life easy for yourself for those mornings when everyone has been up all night. I know he will grow out of this someday and now is my time to accept who he is and be patient, it’s alot better than it was 2 years ago so I know it will keep getting better. Thank you for sharing your experience, Jennifer! Comments like yours are exactly why I wrote this post – for everyone who has been there with a child who truly struggles with learning how to sleep. ALL my kids sleep now (even my four-month-old baby #4! ), and I hope that becomes the case in your home soon. I don’t think it’s ever too early to start a bedtime routine; just don’t expect to see immediate results. Pick a few calm activities that you would enjoy doing with your baby, and make it a part of every evening. Starting now will mean that it’s already established by the time she is old enough to really think about what is going on, which I think can help. I used to try to keep my babies awake so they would sleep, but never really saw results. Then I turned to sleep experts when some of my kids (one in particular) had major sleep issue, and they told me that, with babies, letting them sleep more during the day can actually help them to sleep more during the night. So with my youngest (currently four months old) I really worked at making sure she took a nap any time she seemed tired. It could be coincidence, but she is definitely my best night sleeper – and my most cheerful child during the day. If I could go back in time, I would have my other babies sleep more during the day, not less, based on this experience! You are at one of the most exhausting points in parenting! With my kids I find that the sleep deprivation starts to get better starting at 10 weeks or so – and in the meantime, take any naps you can get! One last thing: I had the same wet shirt problem until I discovered Lansinoh’s breast pads. They are super absorbent and work better than anything else I have tried; you just have to sleep in a nursing tank so they stay in place. I hope your baby starts sleeping for you soon! You need to find a way to move your baby out of your bed Into His Own His Maintaining security while. Just lveiang HIM to cry Will not Achieve this and you will end up with a very stressed, apologetic baby. On the other hand, it is well Recognized That a baby’s sleeping habits are basically cast in stone by around four months of age. In other words, if h is in your bed at four months it will be traumatic Extremely HIM to move out of your bed until he is old enough to Understand That You have your bed and he has His and That It does not mean you do not want to be with HIM (usually at around four years old.) My Advice. Buy a bassinet if you do not have one. Put baby to sleep on your bed next to you in the bassinet. When he cries, comfort HIM Quickly with your voice, but do not pick HIM up. Keep soothing until he settles. HIM put to sleep in the bassinet During the day too Whichever room you are in at the time. If he cries, soothe with your voice and touch but do not even pick HIM up. Eventually he will associate with the security of the bassinet and Mom will not fret as long as you are close. At this stage place the bassinet in the crib for His daytime sleep. Be quick to soothe but do not pick up. When this starts to go Smoothly try it at night. You will not get much sleep the first nights but he will settle Few After A Few Days. I have HAD four babies, all sleeping through the night in Their Own Hotel from 8 weeks. They all still sleep right through. i never have to get up for the unless Them They Are Sick. Both in the long run you and he will sleep better and be healthier if you Establish a good sleep pattern now. QUOTE. . . I know I’m in the minority on this one, but I sonlrgty believe babies cry When They need to have. Even Though It May Be a huge inconvenience, if your child needs you by HIM I think That You Should Give to Him. You can try getting a sling so he can nap while you still move around. While it Requires to sacrifice When They are little (that’s the Meaning of parent I think LOL!) it is very good for your future relationship. It builds on bonds, Rather than communicating to your child who needs you for some reason, That You are unavailable and will not need to answer When He has. I know there are a lot of people who believe this is teaching a Child to be selfish, but, HAVING done it Both Ways myself, I very sonlrgty disagree. Children learn to exercise Their Will During what we call the terrible 2 s (and 3 s as anyone with a 3 year old will tell you). Before That, When They Cry, They have to need. Their actions are natural responses to Their Needs. I Completely agree! The Most Even staunch advocates cry-it-out (eg Ferber) recommend waiting until a baby is at least one year old. You can not spoil a baby with love and comfort! I love this post is it okay I post it on my blog? I’m glad you love the post! You are welcome to post a link to this post on your blog, but please do not post the actual post. Just a suggesting, try using a sleep sac. For my first child I held her all the time and even slept on the couch with her because she would not sleep in her playpen. For my second child, right from birth I let her sleep in her own bed and after about a month and a half I tried the sleep sac, now she sleeps through the night and has for two months. That sounds well worth trying, Penny. Thanks for sharing your success story! I’m so glad co-sleeping helped him sleep for you! So many are strong believers in the CIO method. Personally, I was never a fan. I’ve come to realize every child has a different need based on their personality. Some are ok with gentle reassurance while in their own beds – some are more needy. My daughter from the day she came home from the hospital wouldn’t sleep alone. We did the crib, the bassinet, the snuggle nest that is in the bed & after 2 months of total sleep deprevation I held her in my arms to sleep & it was the best sleep our whole family had since she arrived. No medical problems, she just wants human contact at nights. At 2 years old she still often sleeps in our bed. She is a secure happy little girl who has the comfort that mommy & daddy will always be there. Honestly, we get more sleep when she’s in the bed than waking up several times to quite her down. As a working mom – this time is priceless. She won’t be in our bed forever & this time will be gone in a blink of an eye. In the grand scheme of things these few precious years of bonding are worth everything – we’ll never have it back. Baby number two is almost here & we’ll play it by ear based on his needs as well. Thank you for writing this article as a reminder that no matter how tired and pushed to the limits these early days are – they don’t last forever & are so special in the end! Thank you for sharing this here! It sounds like you found a wonderful solution for you and your daughter, and I really appreciate your sharing what worked for you here – I think we all need to share our experiences, because different things work for different people. And getting more sleep is ALWAYS good!!! It’s nice to see a list focusing on how to cope rather than on how to get your baby to sleep. I’ve tried different methods but my 10 month old still does not sleep well and so I like the different slant here. I just found your blog. I want to say thank you! My miracle was a preemie. She’s now 5 months old and has several medical needs. Meds,food and she’s sick often. She is my special girl. They never said it would be easy, but they did say it would be worth it! They were right. I struggle with sleep as I get fluctuating amounts. So to any other special needs Mommies that find this my tips so far are : Sometimes it is ok to walk away! If your upset know that you Can just walk away for a couple minutes. Keep a go bag! It should have everything your little one needs to go to the ER or in case of any other emergency. Prefill your medicine syringes or pills so you aren’t turning on every light and trying to read mls in the dark! And you’re not alone! Thank you for sharing your tips! You sound like a wonderful mom, and you clearly adore your baby girl. Excellent advice! Yes, that is my daughter Lily as a baby! My Lily will be 4 in August. How funny that they look so much alike as babies! Cosleeping never appealed to me. When my son was 14 weeks old and only taking 20 min naps during the day, and it took him over an hour or more of coaxing to fall asleep at night (oh, and several night wakings to nurse) AND his 2 year old brother ALSO refused to nap (screamed the whole two hours) while taking 2 hours of screaming to fall asleep at night, there was no other option that CIO. I had nothing left to give my children. I had severe PPD (undiagnosed) and being around them when they were crying was heartbreaking and maddening at the same time. After 2 weeks of CIO the newborn went from crying for 45 min, to whining for a minute or less at naptime, and for less than 5 minutes at bedtime, with only 2 night wakings. The toddler was just going through a phase and after a few weeks, went back to normal sleep patterns. But mama was a wreck! I love the moral of your story. Thanks for sharing your experience. I couldn’t have found this at a better time! My almost 2 year old has hit a horrible sleeping phase and I feel more sleep deprived than I did when he was a newborn! He’s always been a horrible napper but slept 14-15 a night so I’ve been spoiled lol. I guess I just have to remember it doesn’t last forever!! I hope he starts sleeping for you again soon! Sleep deprivation is hard! God is a God of order and babies benefit from a FLEXIBLE routine that includes predictable nap times. All babies can learn to put themselves to sleep with appropriate training from their parents. The crying that naturally happens during this training is short term – if done effectively you will not have a baby that cries for long periods every nap time – they learn to go to sleep very quickly. Mothers need to get good rest so that they can be good Mothers. It was sad to read a comment above about not having more children because of the sleep deprivation that results. I have 6 blessings from God who have all slept through the night before 3 months (the twins slept though at 5 months but 3 months adjusted age.) Always feed a hungry baby, change a wet one, burp a windy one but when there is nothing wrong with them, they just need to sleep. Take a Preparation for Parenting class and learn how to help your baby truly become a blessing to your family. I just have to say how beautiful this post is! There are so many factors when it comes to sleep! For us, it took 2.5 years. My son has dealt with horribly itchy eczema that would keep him awake, and if he was not in our bed, he would itch himself raw and bloody. Around the age of 2, he moved out of our bed, but I would nurse him to sleep in his own bed. Soon after, his little brother was born, and within a few months, our oldest started sleeping through the night with a fan blowing (that was key). Now, he’ll only get up if he has to use the potty. Our infant is not sleeping through the night, but I haven’t felt like putting in much effort since he naps beautifully in the crib and why go through the trouble if hubby and I don’t mind having him with us, especially while teething etc? God Bless!!!!!!!!! Sleep deprivation is soooo hard, so thanks for sharing this list. It’s nice to know that it doesn’t last forever. :) It was easier with baby #2 because I knew that it would end at some point. I also would write everything down. Especially nursing times. I was TERRIBLE remembering when I last fed my girls. Every time sounded exactly the same, so I recorded it all those early days. That’s great advice. Sleep deprivation is tough, and knowing it won’t last forever definitely helps! Wow, so many comments from when this first posted! It’s kind of amazing how blogging has changed since then. Yes, it’s a completely different universe!